Sherpa, Tenzing Tashi. 2018. Sherpa Cultural and Ecological Reflections. Kathmandu: Khumbu Sherpa Culture Conservation Society (KSCCS). 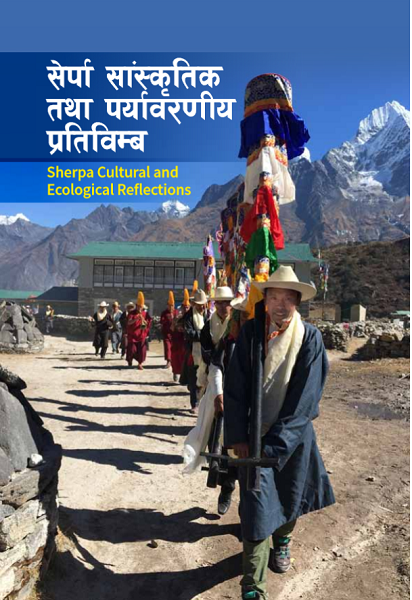 Sherpa Cultural and Ecological Reflections by Tenzing Tashi Sherpa is a major achievement and contribution to Sherpa studies. Tenzing Tashi Sherpa is an elder of Nepal’s Sherpa indigenous people, a regional cultural and conservation leader, and president of the first Sherpa culture and conservation organization and the ICCA Network Nepal. He lives in Khumjung, the largest Sherpa village within Khumbu, the Sherpa territory that is also today Sagarmatha (Mt. Everest) National Park and World Heritage Site. The main text is in Nepali (an English translation is in development). There is also, however, a final chapter in English on “Managing the Sherpa Indigenous and Community Conserved Area in Sagarmatha National Park,” written by Vivek Dhar Sharma (GEF-Small Grants Programme, Nepal). This chapter provides some background on Sherpa conservation practices, summarizes the main activities completed by the Khumbu Sherpa Culture Conservation Society (KSCCS) through their GEF-SGP supported project “Strengthening Sherpa Community-Based Conservation and Coordination with Sagarmatha National Park (SNP) and Buffer Zone,” and shares some opinions on recognizing Sherpa ICCAs within the national park.